THE recent decision by the management of An Post to close the post office which has stood at Liberty Square, Thurles, Co Tipperary, for 160 years in favour of a new location in a Dunnes Stores-anchored shopping precinct away from the town centre has rightly provoked emotion and anger, with thousands of local people attending public rallies and taking to the streets in protest. This might look superficially like a little local issue: a small-town-resists-change story. 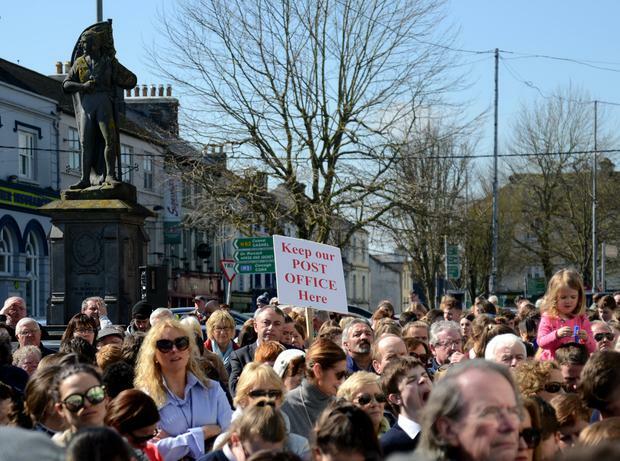 But rural towns all over Ireland, especially those which have post offices at their geographic heart, should be alarmed by what the Thurles decision represents. It raises profound questions: about the Government’s commitment to reversing the decline of small towns and the socio-economic blight it brings; about An Post’s conduct as a semi-state company accountable to the taxpayer; and about local democracy in Ireland. The new location An Post has chosen for Thurles (without any public consultation) is almost 1km from the town’s square and bus drop-off points used by pensioners and people who have no other means of travelling into town from rural areas. There is no parking on ground level outside the centre, so anyone using their own transport will have no choice but to use the busy, adjoining multi-storey car-park. Many older people, for whom the post office plays a vital role as pension collection point, find such car parks difficult to negotiate. Users with mobility issues are forced to contend with the escalators and automated walkways they often avoid for fear of falling. As one older person dismayed by the Thurles move said during last week’s public protest: “I live alone and rely on the bus to get into town on Fridays for the pension and my shopping. Which begs the question: are the older people or those living with disability or mobility issues who currently rely on services at town centre post offices not the type of customer An Post wants now? Nobody is saying An Post should not develop new products, services and post office layouts to allow it to compete, but it should be possible to do this while still fulfilling its duty to serve existing customers from a town centre location. With the recent launch of its new logo and the accompanying storyline about a fictional twentysomething customer named Ciara, one could well believe An Post has already decided that anyone over the age of 40 is no longer worthy of its attention. The irony is surely that the young customer An Post is so anxious to facilitate hardly ever goes to a physical post office anyway, but conducts their business online. This high-handed Thurles decision (public consultation is only legally required in the case of a post office closure) suggests An Post is in fact pursuing an aggressively profit-led corporate strategy. Financial services and e-commerce are prioritised ahead of the company’s remit to serve the needs of local communities. An Post is clearly signalling the end of stand-alone post offices in our towns, opting instead to emulate banks with open plan public areas, minimal numbers of staff, and more automated machines. An Post chief executive David McRedmond has even suggested recently that he wants more post offices to “co-locate” within supermarkets. Unlike Dublin and the other Irish cities which have rebounded from the effects of the financial crash, many of Ireland’s rural towns – Thurles included – are still struggling for survival. Official Government strategy, as highlighted in the Ireland 2040 Plan, acknowledges the threat, emphasising as a priority the protection of small town centres against further decline. National Policy Objective 15 aims to “target the reversal of rural decline in the core of small towns and villages through sustainable targeted measures that address vacancy and deliver sustainable reuse and regeneration outcomes”. An Post’s decision to close a viable town-centre post office surely flies in the face of this strategic objective of national interest. IT can only exacerbate the hollowing out of the heart of Thurles, where the remaining independent local shops are struggling to compete with out-of-town global supermarket giants and hobbled by restrictive local parking policies. An Post’s move seems to make little economic sense even on its own terms. It is relocating from a large premises which it owns outright (located a few yards from the historic Hayes Hotel where the GAA was founded) and could be sympathetically modernised or extended in keeping with its listed status, to a leased, yet-to-be developed unit in a privately owned shopping plaza in a mainly residential area. An Post has so far refused to provide any transparency about the cost to taxpayers of this relocation. We have all seen the serious consequences recently in Britain and France (with Brexit and the ‘gilets jaunes’ unrest, respectively) of the perception in economically struggling regions that they have been bypassed by investment and then kicked in the teeth by policies which deny them any hope of economic recovery. The Irish Government too may yet find it has a brewing grassroots revolt on its hands if it allows state or semi-state agencies like An Post to ride roughshod over the needs of the communities it is supposed to serve.